This is my parents' dog, Daisy. She's getting on in years now. She was born about a week before Joel and I got married...her birthday is June 17, 1999, and we got married on June 26, 1999. She was a super hyper, happy puppy and adolescent dog. So much so, that I was totally worried about how she would behave around my brand new little baby Bria. I think Daisy was about a year and a half old when Bria was born. For a time, I never let Daisy near her when I was at my parents' house. But one day, she escaped from whatever room she had been locked up in and came to check out the new human. She was totally gentle and protective of her, and I never worried about her being around my babies ever again. She was a wonderful playmate as my kids got older, and loved nothing more than to run around with them in the yard or follow them around the house. I really wish I hadn't packed up all of my pictures from that time, so you could see, too. She's just always been such a great dog for my kids, even now as she's getting a little arthritic and old lady-ish, she really loves them. She doesn't have the energy to run around near as much as Sophie would like her to, but she does still follow them around the house. You know, to make sure all is well with her charges. But the best part? To find Chloe reading Dr. Seuss to Daisy, and Daisy actually listening. Daisy is a very sweet dog-And a good sport! Awwww! Thanks from Daisy as she lays next to me konked out! It has been a very busy few weeks for her to keep track of everyone, including the playful teasing from Duke! I really love dogs. She's so cute! Oh my word that picture of the dog listening to the story is absolutely PRICELESS! I never was much of a dog person until we got our Sadie, who is a small golden retriever and is the sweetest thing in the world. Even as a puppy she was extremely gentle with little ones. And she loves my students. She lays as close to the piano bench as she can get away with during the hours that the kids are there. They adore her. Daisy looks a bit like her. And Daisy's birthday is the same as mine! I know, how cosmic is that?? Ohhhhh! That is a great photo story! That is just about the greatest picture I've ever seen. You know, I was never really a dog person until I had kids, and now I think they are a crucial part of family life. You guys gonna get one after you move? That is a beautiful relationship. What a wonderful dog. Animals can really bring so much joy and companionship into our lives. My little girl could use a Daisy. Oh, good dog! Good, good dog. This makes me want to get a dog. My poor kids - they have begged us for years, and I would really like to, but we just haven't yet... if only we could be sure we'd get a Daisy. AWh... they're gona miss her. Oh that's just too cute! HAHAHHAHA!!!! Oh, man, that is priceless. OK, that is just too cute. You're making me miss our little Cujo. What a great picture I love it!!! If all dogs were like that I MIGHT let my kids get one. What a special dog! The picture is awesome. I love dogs. I have a daisy also. 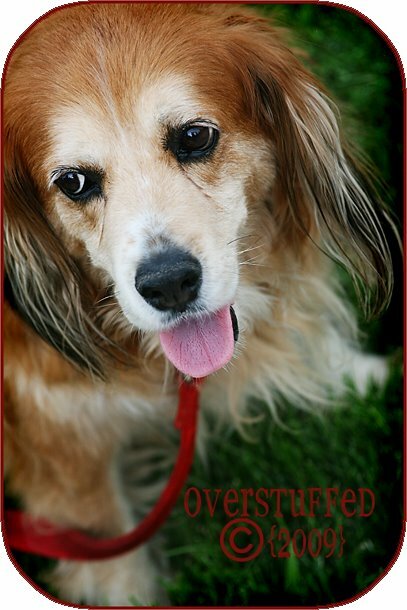 She is 6 year old miniature dachshund. Dogs make such wonderful pets and our children can really learn much from them. This was a really cute post. 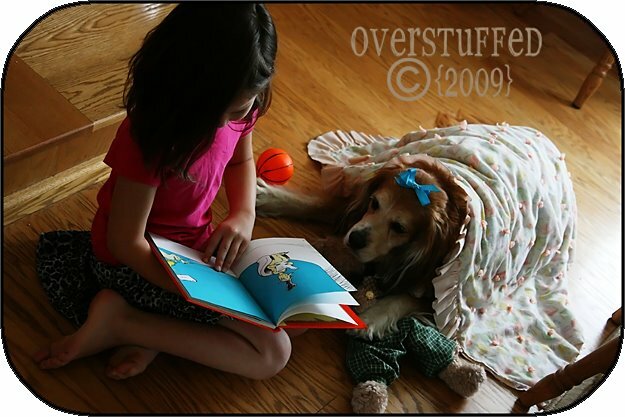 Your daughter reading to the dog is so incredibly precious! She'll be so glad you thought to take that picture when she's older. That picture of her reading to Daisy is so priceless. I love dogs! I wish you still lived here to take pictures of Lily because those are so cute! We had a boarder collie named Daisy and she was a sweetheart with everyone...She was my companion and best bud.She was over 14 years old when she died and I still miss her every day.